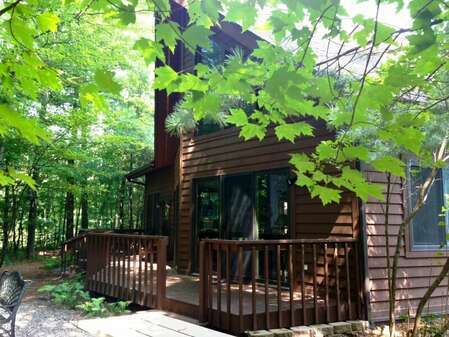 Located on a quiet wooded lot with quick access to everything Wisconsin Dells, this cedar-sided home features four bedrooms plus a loft and is the ideal getaway for family or friends. The Bearclaw Cabin consists of three beautifully finished levels with log cabin décor throughout. 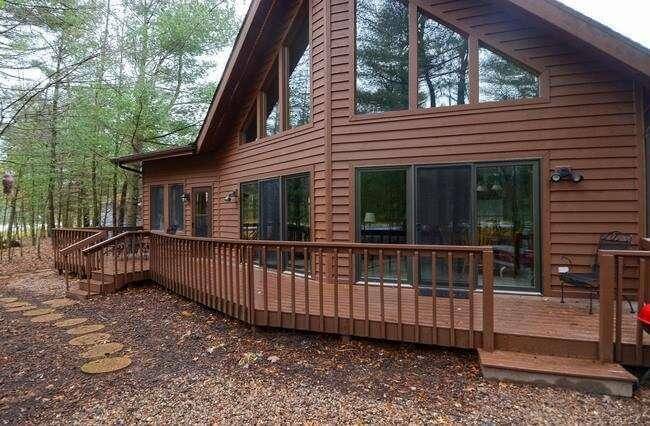 For those looking to the outdoors, sliding doors lead out to a huge deck complete with a charcoal grill, additional seating including a picnic table and in ground fire pit. It sleeps a maximum of 14 people. Vaulted knotty pine ceilings welcome guests to the great room on the main level upon entry. The dining area has table with seating for eight and a breakfast bar which seats four. The user friendly kitchen comes equipped with full size appliances including a dishwasher. Relax the evenings away in front of the gas fireplace in the family room which also comes equipped with a sofa sleeper. Or, guests may choose to lounge the weekend away in the adjacent three-season room which is adequately equipped with a table and chairs for additional seating. The main floor also has two bedrooms, a full bath, and laundry room with washer and dryer. The first bedroom on the main floor has a queen bed and the second bedroom is a great room for the kids with a twin bed, a bunk bed (full size on the bottom and a twin size upper), a desk and plenty of room to play. The second floor offers a loft with game area, TV/DVD and a queen size sofa sleeper in addition to the roomy master suite. Guests of this bedroom will enjoy a king size pillow top bed, sitting chair, TV and a private bathroom that comes with double sinks, a tub and walk-in shower. The recently finished lower level is home to the game room complete with a wet bar and mini fridge, pool table and 36inch TV/DVD. The basement also includes a third full bath with a double sink and shower in addition to the fourth bedroom (two pillow top queen size beds). Complimentary WIFI adds to the conveniences afforded to guests of this home. This is a pet friendly home. A pet fee of $10 per pet per night will be charged. Two dog maximum. Sorry, no cats allowed. 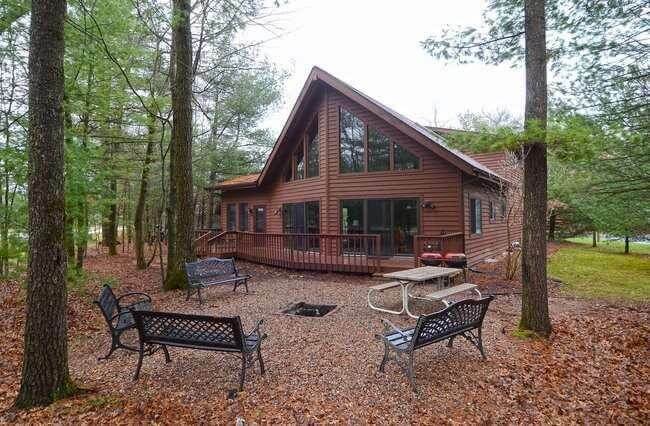 The Bearclaw Cabin is located near Spring Brook’s scenic foot bridges and fishing at Blass Lake in the beautiful mature area of the resort. Bring your bikes, scooters and walking shoes to enjoy the beautiful scenic walking paths. The home is also just a short drive to Spring Brook’s Clubhouse, which is home to the Spring Brook Sports Bar & Grill, indoor/outdoor pools, fitness room, golf course and pro shop. Home sleeps maximum of 14, rates based on 8 people over the age of 3. Extra guest fee of $15/night per additional guest applies. Security Deposit of $500 required.